This is the largest quilt I have ever attempted. So happy it's finished! It fits our queen size bed, and I also got some photos of it turned sideways on a full-size bed. Here are a few more shots. 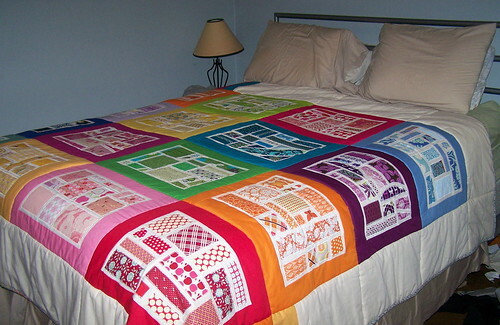 Bottled Rainbows Quilt happily hanging... and spread out on the queen-size bed. I used Sugar Pop for the binding (machine stitched to the back, hand-sewn to the front), and settled on some upcycled sheets for the large back. They match my buttercup block. I realized that this quilt suddenly went up in value when I went to the emergency room over the binding, and I really love it still! Linking up to Sew Modern Monday, Finish it Up, and Summer Sewing! stunning! Love it on your bed, and love the color of the back. Yay for finishing a quilt! It's beautiful. I love the border,too. That is a gorgeous quilt. I love it! Fantastic (except the ER bit!)! Looks amazing, I love it!! Awesome! I love the colors. I will also try to bring you scrap! very impressive work! Well done! Oh my gosh, I love it! I'm so jealous (I only have 2 blocks, lol). I LOVE LOVE LOVE LOVE LOVE the little stripes you have going off the sides...genius! 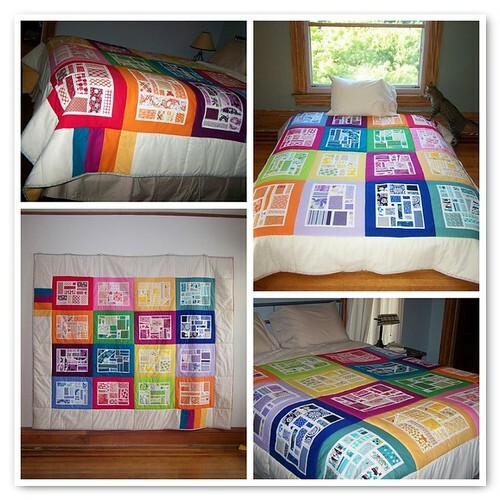 Your bottled rainbow quilt turned out beautiful! Love the yellow on the back too! Wow! It's so beautiful! 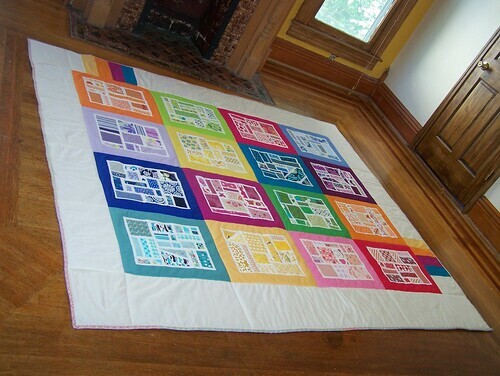 What a nice quilt to wake up to on a dreary winter morning (or a happy spring morning for that matter)! I love it! What a fabulous border too...makes me want to make one too! oh my, so pretty! love the stripes on the border. very clever! I love your border for the Bottled Rainbows! Very clever! Sorry to haer about the e.r. trip though. That's sucky! Oh my goodness your quilt is gorgeous! I love the colors and patterns. It's obvious you took great care in the details. Yikes! Sorry about the e.r.-hope you're all well and stitched up! *thanks for your suggestion to submit my tutorial for adding belt loops to a shirt. I hadn't even thought of it - I followed your great idea - we'll see if they post it! 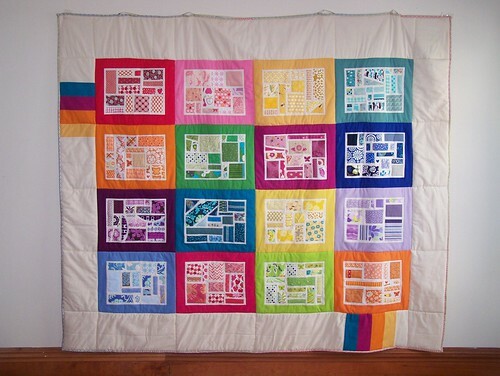 I really like the solids you added on the sides - adds so much to the border! 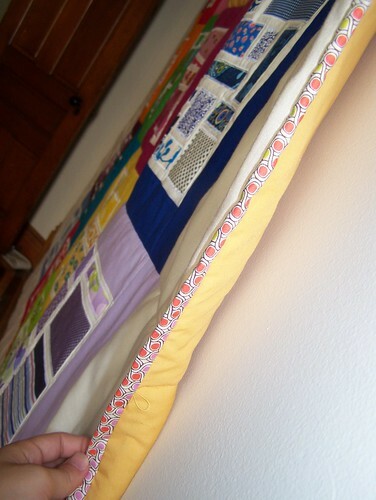 The quilt is fantastic in general - love seeing these around bloggyland. It's so beautiful! I especially love the rainbow accent blocks on the front, and the binding is such a great choice! I love that print. I love this quilt, the border makes it even more special. Great job. So beautiful! I love the white border and the little "rainbow" you added to it! So pretty!